Precise geometric motifs surround two red deer in an exquisite design. From talented members of Women United for Artisan Development, this cushion cover is woven by hand on a backstrap loom. Cording defines the borders, and the back is solid black. Should one of the threads snag, the artisans suggest you pull it back into place from the back of the fabric with a fine crochet hook. 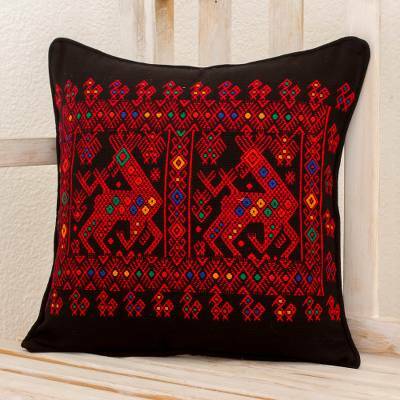 You can find cotton cushion cover 'Red Maya Deer' by Women United for Artisan Development in pillows & throws categories such as Animal Themed Cushion Covers, Maya Cushion Covers, Hand Woven Cushion Covers and Cotton Cushion Covers. Enjoy exploring these sections for other Novica treasures. The group is a network of many women artisans throughout several communities. They work together to produce large numbers of beautiful handwoven decor accents and fashion accessories, and all support each other in times of need. Overall, there are about 400 women artisans in their network. With the traditional backstrap weaving techniques taught by their mothers, who learned it from their own mothers, the women incorporate a wide variety of beautiful designs with traditional patterns and techniques. Several women in the group or their family members suffer from diabetes and other diseases. Some conditions are so severe that they stay and work from home to rest or to take care of ill family members. Our motivation is strong — our families and our children. We want to be able to send them through school so they can become who they want to be in life, so they can fulfill their dreams. The Women United for Artisan Development group is made up of women of all ages, many of whom have children or grandchildren they support. "Beautiful design, workmanship, vivid colors!" "During the civil war, many families were separated by the violence, by kidnappings, murder and exile. We are survivors, orphans, widows. But we are strong women…"
"Thank you for your interest in our story and our designs. I'm Oralia and I'd like to tell you a little bit about us. "Our group is made up of many women who carry on the weaving tradition our mothers and grandmothers taught us. We work at home on our looms. We're hardworking women, mothers and often we're the heads of our households. We come from different parts of Guatemala — some from Sololá near Lake Atitlán, and others from the lovely town of Quetzaltenango, known as 'The Cradle of Culture.' Quetzaltenango has produced many writers, painters and musicians as well as woman weavers like us. "There are almost 400 women in our group and foreign volunteers are helping us. Our past has been difficult and a bit sad. We lived through the civil war that Guatemalans suffered for so many years. We were caught between both sides, the rebels and the army. It was a time of great anxiety and pain. Many families were separated by the violence, by kidnappings, murder and exile. We are survivors, orphans, widows. But we are strong women and highly motivated to continue struggling and to find happiness. "Our work is inspired by mutual support, by recognizing that we are creative women. We are capable of developing beautiful designs and creating weaving networks based on honesty, trust and respect. Because our towns are relatively nearby, we've been able to organize the designing and weaving to fill orders very well. We have representatives who attend the meetings to keep us up to date and to divide up the work among us. "However, it hasn't been easy to find outlets to sell our work because we don't know a lot about technology to reach all the shoppers and other people who want to help us. Our motivation is strong — our families and our children. We want to be able to send them through school so they can become who they want to be in life, so they can fulfill their dreams. "Today, we're very grateful to Novica and we want to thank all of our friends and shoppers because, by offering our weavings online, we'll be able to generate more income and continue working to achieve our dreams."